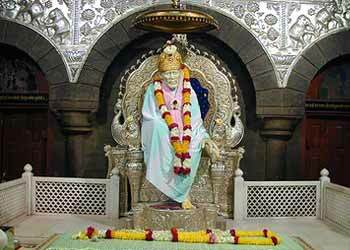 Here is Some Information about Shirdi Saibaba Temple in Shirdi Maharashtra India. 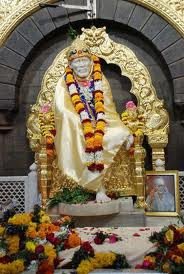 Aarti Timing : Kakad Arati 5:15 a.m.
Shirdi is a small town on the Ahmednagar- Manmad highway. Situated around 307 km northeast of Mumbai, the town is around 6 hr drive from Mumbai. 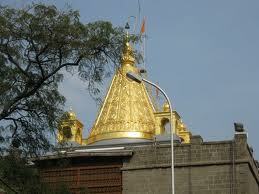 Shirdi is a silent place with population of around 15000. The city earns the major part of its revenue from the tourists and pilgrims whose number sometimes crosses the 30000 mark with utmost ease. This holy destination is a home to a great legend Sai Baba who lived her for around eighty years before he went into his samadhi some 80 years ago in 1918. 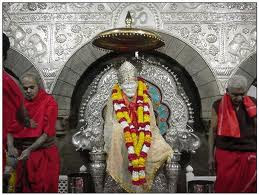 Shirdi is mainly a religious center. The town is tiny and is of just 2 Sq km. It has a main street and is full of narrow by lanes that are covered with small shops, most of them selling material that are offered at the temple. 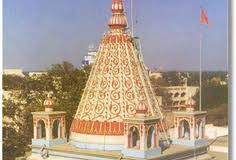 Samadhi Mandir of Shri Sai Baba was actually owned by a millionaire from Nagpur, a famous Sai devotee Shreemant Gopalrao. Gopalrao wanted to keep an idol of Murlidhar here. 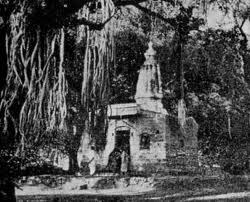 However, Baba himself became Murlidhar and the Mandir became the Samadhi Mandir of Baba. 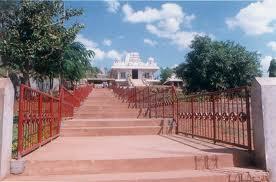 The Mandir is built with stones and Baba's Samadhi is built with white marble stones. railing is built in marble around the Samadhi and is full of ornamental decorations. In front of the Samadhi are two silver pillars full of decorative designs. 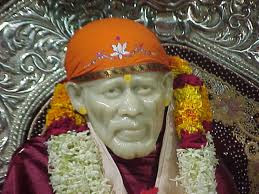 Just behind the Samadhi is Sai Baba's marvelous statue made of Italian marble, which shows him seated on a throne. This idol was made by the late Shri Balaji Vasant. This statue was installed on 7th October 1954. Above the statue is an open, silver umbrella. 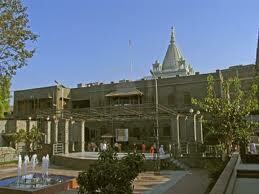 The front of the Mandir has an assembly hall where about 600 devotees can be accommodated. Here is a showcase where various things handled by Baba are kept. On the first floor of the Mandir are pictures that depict Baba’s life. The daily routine of the temple starts at 5 o'clock in the morning with Bhoopali, a morning song, and closes at 10 o'clock in the night after the Shejarati is sung. Only on three occasions the temple is kept open overnight i.e. on Gurupoornima, Dassera, and Ramnavami. Every Thursday and on each festival, a Palakhi with Baba's photo is taken out from the temple. In history, Saibaba's parents, birth or birthplace are not known. This mysterious Fakir first manifested himself as a young lad of sixteen under a Neem tree in Shirdi for the sake of Bhaktas and remained there throughout his long life. He transformed the lives of those who met him. For all the seekers he uttered only three words- 'Allah Achcha Karega' by way of his blessings. Baba stated that his mission is to “Give Blessings” without discrimination to all, and he proves it in myriad ways by healing the sick, saving lives, protecting the vulnerable, averting accidents, granting offspring, facilitating financial gain, bringing people into harmony within themselves and with each other and, above all, in effecting the spiritual evolution and transformation of those who came to him as the last resort. 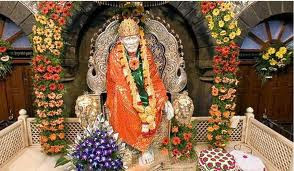 By Road: Since Shirdi is located on Ahmadnagar - Manmad road, it is easily accessible through roadways. Many private bus operators run their luxury coaches from nearby cities to Shirdi at regular intervals. You can also opt for taxis that ply on all major routes. By Rail: The nearest stations are Nasik around 123 km away and Manmad around 60 km away. The best option is the Tapovan Express that departs from Mumbai at 6.30 AM and reaches Manmad at 11.30 AM. There are regular Bus services from this station to Shirdi. By Air : The nearest airport is Aurangabad which around 144 km away. It is connected to other cities by Indian Airlines. It takes around 3 hrs to reach Shirdi by road. Learning is an ever-evolving process. Each and every instance shapes our life in one way or the other. Swami established schools with the divine motive of enhancing the learning of students in terms of mutual respect and cooperation.